Is there a command or macro that would help me roll 5d11 until I get no duplicate values? At the beginning of each session I roll 5d11 and if there are any repeating numbers I roll again until there aren't any. I can't seem to find anything on repeating numbers in the wiki that would let me automate this. If I've missing something I will happily accept the page and read through it. Or if there's like a drop duplicate numbers that would also be great. to the question "Can I use roll20 to get a sample of 5 numbers from 1-11, without replacement?" Since "roll 1d11 until I get 5 unique numbers" is the same as "randomly select 5 numbers out of a set of 11, without replacement"
A better tool to use, is some "online tool sampling without replacement" (what I used in my google search). I used this dcode site. Enter the range of the numbers (minimum 1 and maximum of 11) and how many to choose (5). The first two tries, I got [5,9,11,4,6] and [11,10,6,8,4]. Another online tool that I found. The result you want, randomly choosing 5 of the numbers between 1 and 11, can easily be accomplished in roll20 by creating a custom deck, or "Collection," with 11 cards ranked 1 through eleven. Then just shuffle the cards and draw 5. I dummied the following up in roll20, in about 15 minutes. 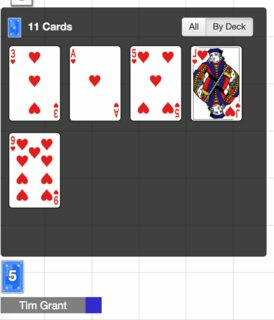 Click “Show” on the deck. 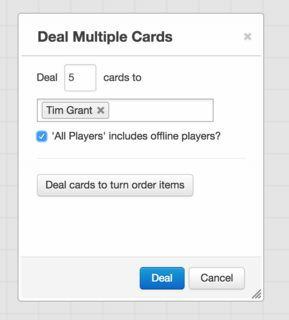 One nuisance is the dealt hand can appear behind the floating toolbar if you are GM and have a large avatar. You may want to show smaller avatars, or names only. You can emulate it by rolling 1d11, 1d10, 1d9, 1d8 and 1d7. On each roll after the first, add +1 for every earlier roll that is less than or equal to the current roll. If this causes the current roll to equal or exceed even more earlier rolls, add +1 for those too. So, for example, if you first rolled a 7 and then an 8, the 8 would become a 9 (because it's greater than the first roll). If you then rolled another 8, it would first become a 9 (because it's also greater than the first roll) and then a 10 (because it's now equal to the second roll). So your first three rolls (natural 7, 8, 8) would become 7, 9 and 10 after the increments. If you now got lucky and rolled a natural 8 on your fourth roll (1d8), it would get bumped all the way up to 11. If you rolled a natural 7, it would only get bumped to 8, and any roll of 6 or less would stay unchanged. Not the answer you're looking for? Browse other questions tagged roll20 or ask your own question.